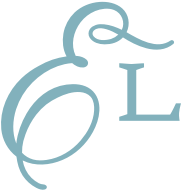 This week we're delighted to introduce fashionable home decor motifs, and Ohli, a sweet and charming little owl in three distinct styles! 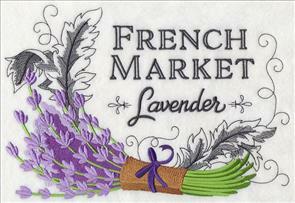 Begin with new French Market designs. 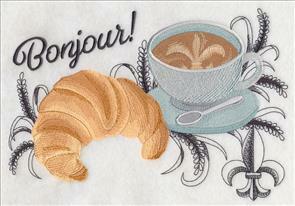 Tasty croissants and coffee add a delicious look to aprons and tea towels. 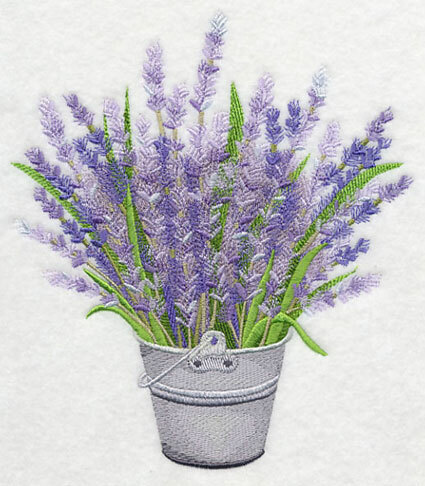 Lavender is gorgeous on totes, pillows, framed pieces, and towel sets. 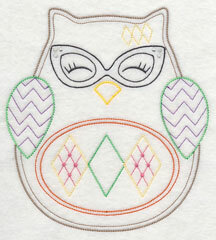 Then, meet Ohli - a little owl eager to add color and whimsy to your embroidered creations. 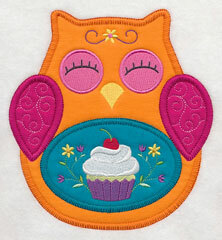 Ohli the Owl has a clever variety of decorations on his tummy, such as cupcakes, tulips, and hearts. 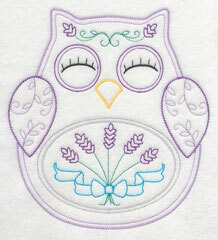 Ohli has been created in three different versions: stitch-filled, vintage-style, and heirloom applique. 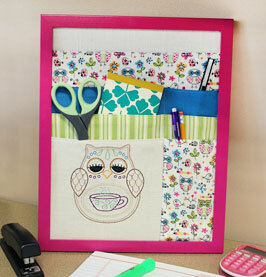 This desk organizer has pockets for handy storage. Click here for project instructions! 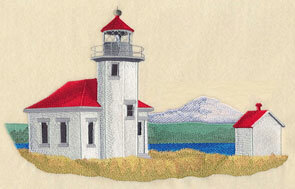 The woman behind Sew Jenaissance is a talented crafter, and a pro in the realm of needle arts. 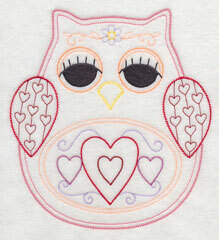 When we saw her adorable creation, Ohli the Owl, we knew that he'd be an excellent candidate for machine embroidery! 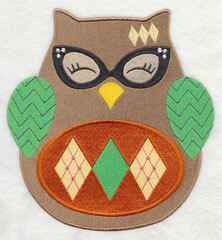 Ohli the Owl is available in three different styles: stitch-filled, vintage, and heirloom applique. 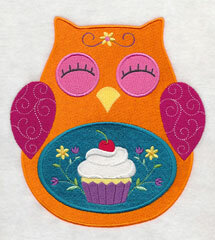 Below he's shown with a cupcake, ready to sweeten up dish towels, placemats, and kitchen decor! 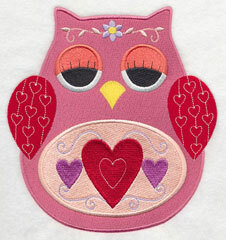 Stitch a little love for Valentine's Day with this design! 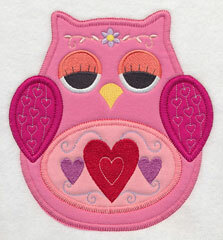 Ohli the Owl has hearts on his tummy, and in his wings, too. He'll be a hit on tote bags, cushion covers, and towels. 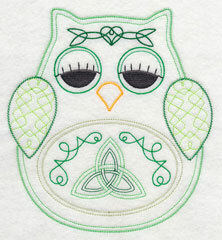 Three styles are available - stitch-filled, vintage, and heirloom applique. 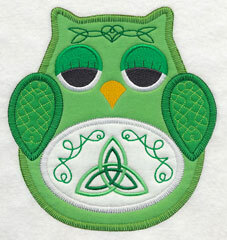 In this design, Ohli is filled with the luck o' the Irish. 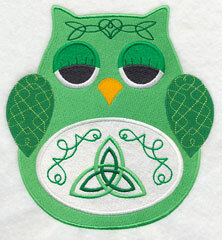 Celtic knot work is featured on his stomach, wings, and forehead. Three versions are available. 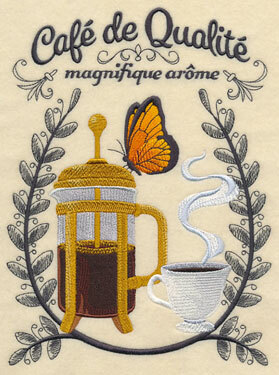 The vintage version is beautiful on quilters cotton, tea towels, and other smooth fabrics. 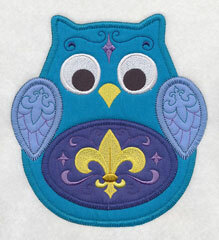 We used flannel for the heirloom applique. 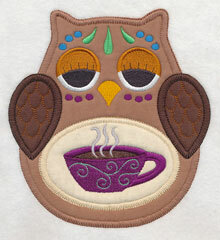 Wake up to this little owl on tea towels, placemats, and mug rugs. A sleepy Ohli has a cup of steaming coffee (or tea) on his stomach. He will brighten every morning! 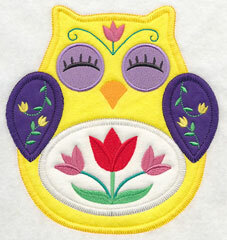 Think "spring" with this bright and cheerful design! A trio of tulips is on Ohli's stomach, and you will find smaller blooms in the wings and on his forehead. 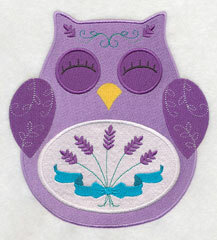 Fashionable lavender is a wonderful addition to bath decor and living rooms. 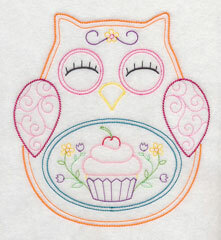 Embroider these designs to make pillow covers, mini quilts, wall hangings, and brighten up bath towel sets. Here Ohli sports trendy argyle and retro glasses. 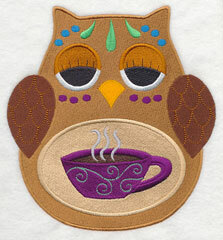 Add his sweet personality to tote bags, blankets, tea towels, and more. Ooh la la! 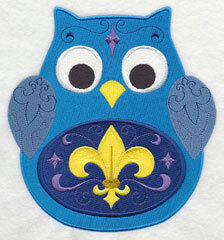 Ohli has fine French fashion - a fleur-de-lis! - on his stomach. Three versions are shown below. On the left is a stitch-filled version. 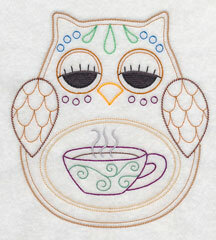 The middle shows a vintage style, reminiscent of hand embroidery. 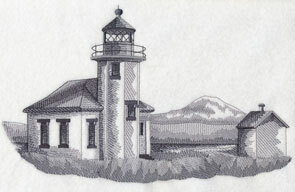 It is beautiful on smooth fabrics, such as quilters cotton, tea towels, and linen. 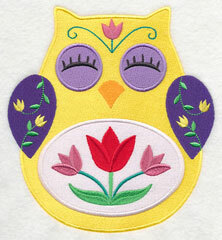 The design on the right is an heirloom applique version. 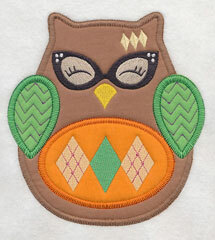 We used colorful flannel to stitch the sample shown below. Get ready to sail away with this seaworthy owl. 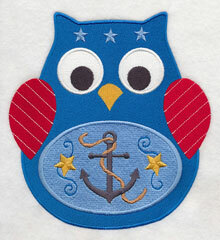 An anchor decorates his stomach, and he has stars on his brow. 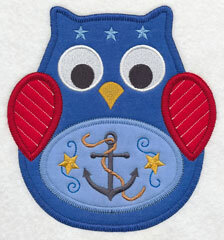 Add to beach bags, towels, and pillows for your favorite sailor. 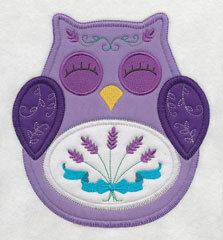 Lavender has long been a motif used in decorating baths and kitchens. This design features the colorful flowers artfully arranged in a metal pail. Add it to a tote for the grocery store or farmer's market, stitch it onto bath towels, or make a framed piece for your favorite room in the house. 6.87" x 7.82" and 5.85" x 6.67" and 4.82" x 5.54"
New "French market" designs let you bring the beauty of Paris to your embroidery projects! Dress up table linens, towels, aprons, and more with colorful lavender sprays, and a tasty croissant with a cup of cappuccino. Note the fleur-de-lis in the coffee's foam! 10.06" x 6.90" and 8.51" x 5.84"
9.90" x 6.88" and 7.76" x 5.39" and 6.85" x 4.76"
A monarch butterfly perches on a French press pot, adding a splash of color to the flavorful design. 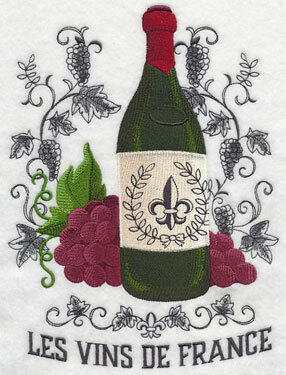 And, wine lovers will adore Les Vins de France on tote bags, pillows, and framed pieces for the dining room. 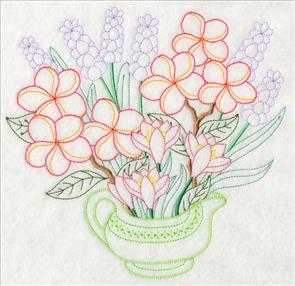 6.90" x 9.19" and 5.85" x 7.79" and 4.85" x 6.46"
Spring flowers bloom and grow from colorful pitchers in these vintage-style designs. 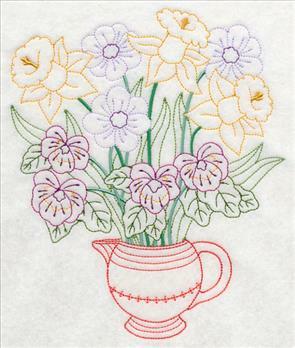 Irises, daisies, primrose, pansies, and daffodils, are sure to bring spring spirit to tea towels and table linens! Vintage-style designs are light, with open areas. 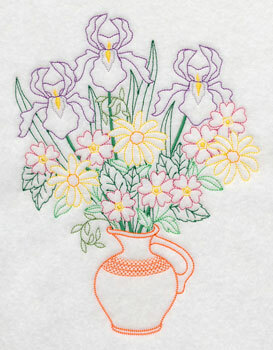 They're reminiscent of classic hand embroidery work. 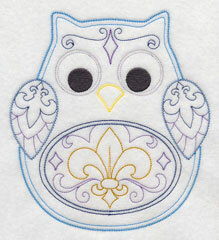 Embroider these designs onto smooth, neutral fabrics, such as quilter's cotton, flour sack towels, tea towels, and linen. 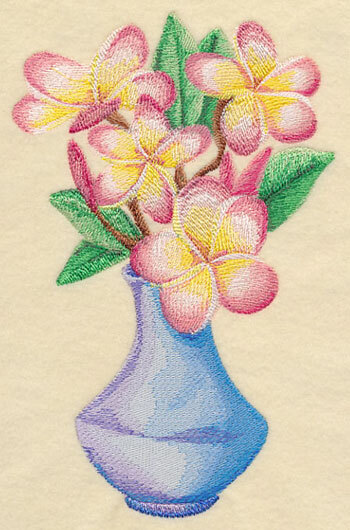 A bouquet of frangipani has been drawn and digitized with a stunning watercolor effect. Colors transition from dark to light to bright, resulting in a dreamy glow. 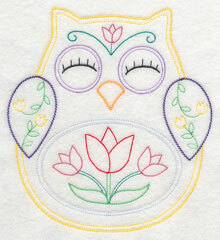 Use this design to make gorgeous mini-quilts, throw pillows, and framed pieces, too. 6.90" x 10.67" and 5.85" x 9.08" and 5.03" x 7.79" and 4.42" x 6.86"
Vicky wrote to tell us that the Point Robinson Lighthouse in Washington is celebrating its centennial this year. She wants to make something special to celebrate the occasion - and she mentioned that she's had requests from her customers, too. Thank you for your suggestion, Vicky! We made two versions - a full-color version, and a sketch-style as well. Enjoy! 11.14" x 6.90" and 9.43" x 5.85"
11.12" x 6.90" and 9.43" x 5.85"
7.78" x 4.83" and 6.84" x 4.23"